Given that we spend so much time away from home, I'm always looking to streamline the bags. On a "typical" hospital day, my car trunk looks like this. My thought when I was chosen for this review was, "Sounds promising! I'm already carrying around the laptop or tablet...maybe it will be a few less books and we can downsize a bag or two!" Jude is an old pro at the IXL program. I first discovered it when he first became a homeschooler, so this is his third year working on it. What drew me to it was that the program is simple. There aren't a lot of bells and whistles, but there are rewards that keep the student's interest. At the end of each activity, if you had enough correct answers, you earned a ribbon; often, you also earned a "sticker" for your effort depending on how much you did (stickers are meted out based on activities mastered, number of problems completed, and time spent working). When you're a four-year-old preschooler, it's all about the stickers, right? However, we have transitioned to more of a book-based program as we've gotten beyond "assess what he knows" and Jude is learning new things. I was curious how well the program would keep up with a first grader. When Jude first started, the program didn't go into high school math. Now, it has programs for students from preschool through 12th grade. Beyond having the opportunity to see how the first grade program worked, Luke also was able to work with the program. He is currently taking the semester off from math and will start Geometry in the spring. I liked that it was going to be a six-week-review that forced him to practice his math skills. Yes, I'm sneaky like that. I was surprised that he was just as happy to get his "stickers" as Jude. He wasn't necessarily motivated by getting one, but rather guessing what would be revealed next. Now, I know there are people who are going to gasp and faint away when I say this, but I will anyway. I like the concept of the Common Core. I don't think a standard "everybody needs to know this basic skill" program is a bad thing. Notice I said I like the concept. What I don't like is how it gets implemented. That's a whole disaster unto itself. But having a checklist of sorts (you can connect to your state's standards) to make sure you don't miss a basic, foundational skill and realize it a couple years later? That works for me. This is a place where IXL is very strong. It doesn't "implement" anything. What it does do is take the concepts a student is supposed to master in each grade, and break the year down into practice areas and checklists. The parent gets to choose what concept the student should be working on, and in what order. If your student completes the tasks at one level, you can start in on the next level and continue building. If your student is uneven and stronger in one area than another, you can work across multiple grades. But if a student completes an entire section in a grade (all the addition skills, all the geometry skills, all the money skills, etc.) you know your student is ready to move onto a new level. I really feel like using this program as a way to make sure I didn't miss anything, and didn't assume he knew something but didn't. With Jude (first grade), sometimes I choose to review and practice something we are working on currently. Other times, I will go back and do something "easy" (like counting or adding small numbers) so he gets some kind of math practice. I also like it as a way to help assess what he has organically learned, so we don't waste the limited "formal school" time we have. For example, we haven't spent much time formally doing geometry. However, he breezed through the section on geometry and identifying shapes. Since he has proven to me he already can identify them, I'm not going to spend time "teaching" them to him. We'll use the time work on something he struggles with (like skip counting). One thing that is nice about the way the IXL program is set up is I don't have to do things 'in order." I like that we can easily stop and start. If we are working and a doctor comes in, we can exit and not lose our place. When we come back, I just choose that activity again and we pick up where we left off. If we are mid-work and I have to run to get somebody from school, we do the same thing. Or, if Jude just isn't getting it, we can stop and come back another time. If I thought he knew something and it turns out he didn't, again, I stop, reteach, and then we come back later. PreK through 1st grade has the added bonus of "click-to-read," so that your child can work independently. Clicking on the speaker icon activates the program to read the problem aloud. We found this was kind of mixed. It is a very mechanical-sounding voice, with very little inflection. I found it better to work with Jude and read things to him. He also has speech and hearing issues, so that may just have been what worked better for him - I could add inflection to help him pick up context. Sometimes, it also just spoke too quickly for him, so repeating the text more slowly helped him understand. What Jude did like about that audio support was even if he needed me to read the problem, he could click to hear the answers. Between the context clues of a picture, and the voiceover for the text of the answer, often Mr. Independent was able to choose the correct one without Mom's help. 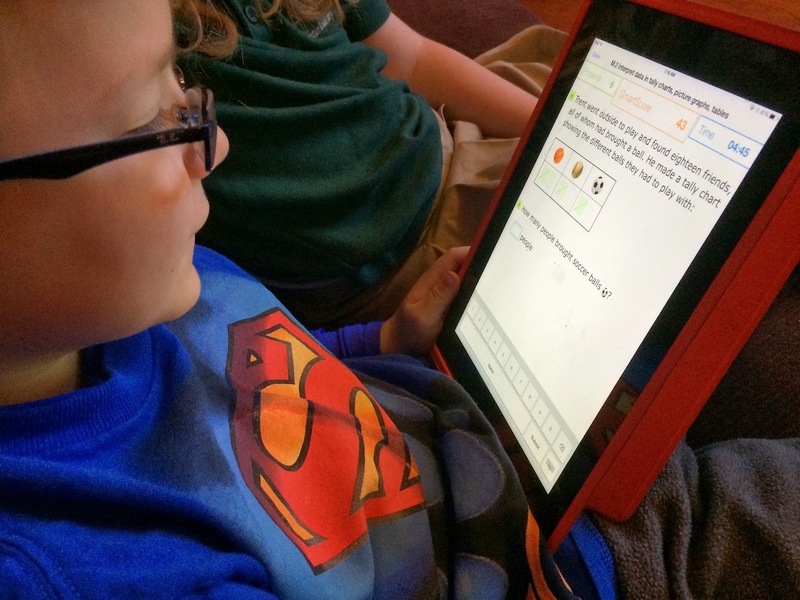 In some ways, we have been able to use IXL for Jude as a teaching program. Once you have the idea of adding two numbers together, it's really just practice, practice, practice to gain proficiency, so we started working with adding numbers within five, then up to 10, and now are moving to up to 20. For "new" concepts, we worked on learning about vertices -- the corners of a shape. Learning and practicing counting the vertices of a square or triangle easily happened simultaneously. First grade "equations" and geometry is fairly simple to learn. 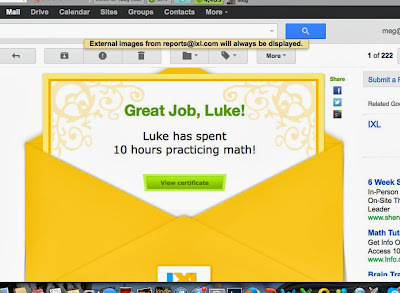 10th grade geometry...not so much, to Luke's chagrin. 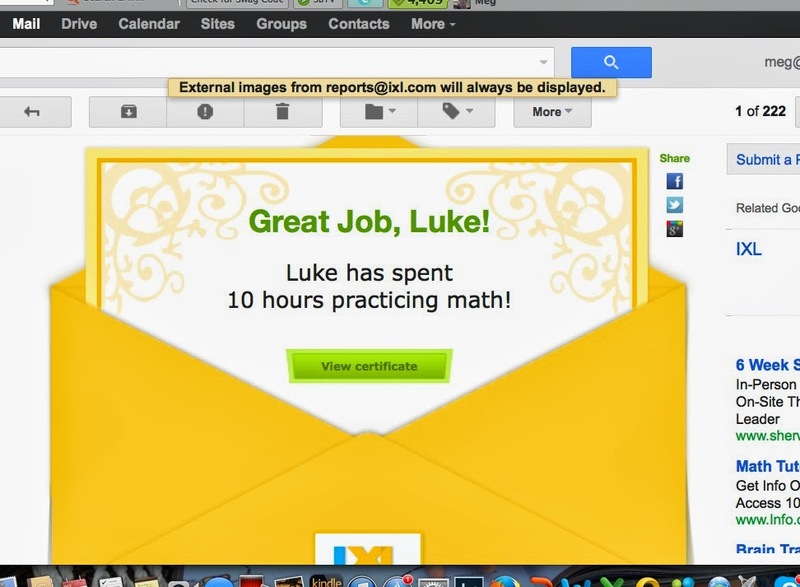 For an older student, IXL truly is more of a practice program. While if you get a problem wrong, it will explain to you the correct process, it takes a lot of wrong answers to learn how to do it. 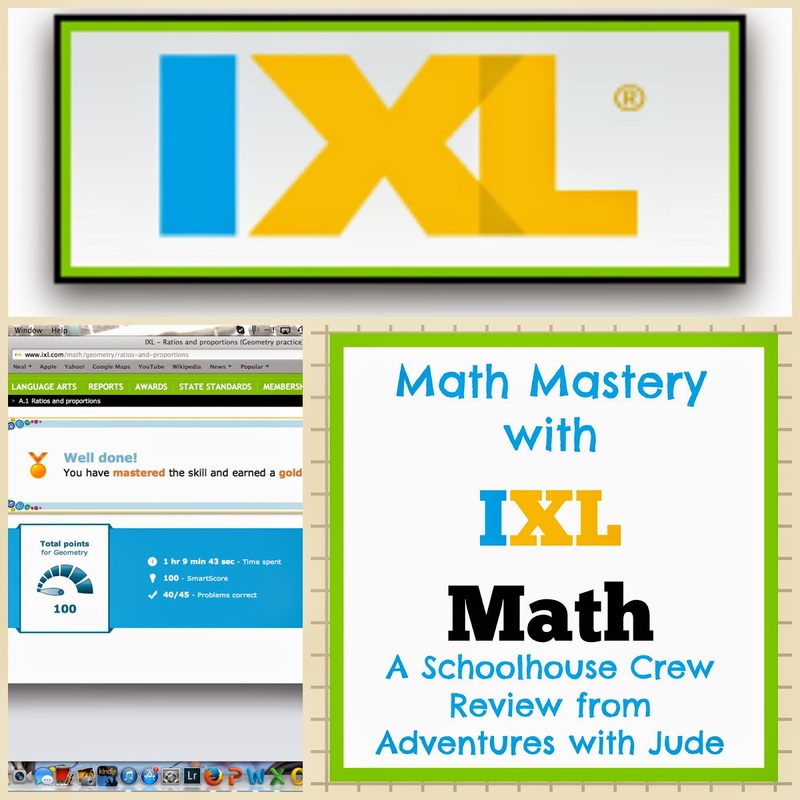 IXL is better for reviewing material to make sure the student has the concept. Luke began working on the Geometry section, and frustration quickly grew. Having had the equivalent of two years of Algebra 1, I thought the first section -- a review of Algebra 1 concepts like ratios and linear equations would be a breeze for him. I was wrong. At first, the frustration was over how he typed information. For example, if the answer is 1234, you can't input "1234" or the programming will mark it as incorrect. It took about 6 "wrong" answers for him to realize it needed to entered as "1,234" with the comma. There were other times when he knew he had to do this but simply forgot (unless actually working on place value as a concept, he's never had to include commas in number writing), and it got marked wrong. This snowballed because IXL uses something called "Smart Score" to assess proficiency. 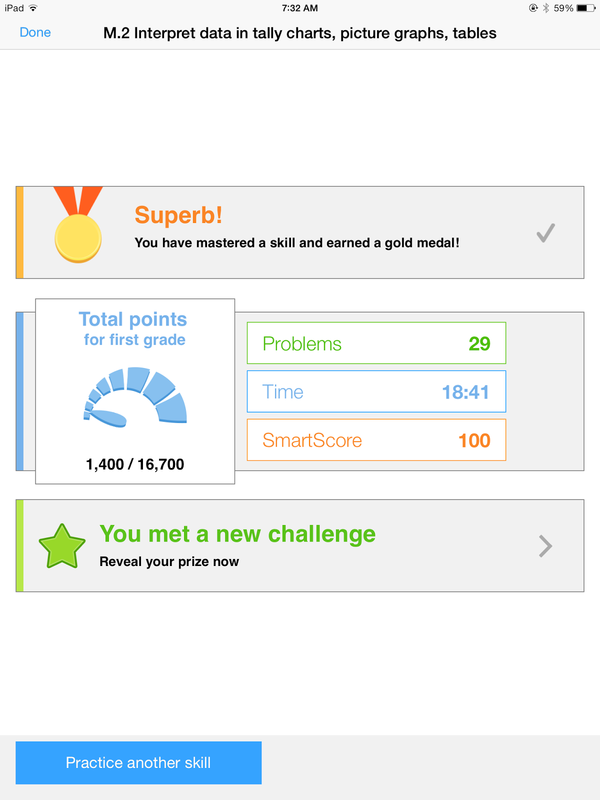 Smart Score is IXL's proprietary algorithm that weights answers based, among other things, on how difficult the problem is and how many in a row you get correct. Scoring isn't simply complete 20 problems, multiply by 5 and there's your score. Some problems are worth more (harder problems, problems earlier in the assessment) and some are worth less. One thing that really frustrated Luke was a wrong answer might lose you 20 points, and it would take four or five questions to gain them back. If he got two or three problems incorrect (either because he flat out misunderstood, or because of mistakes like addition errors or "that stupid comma thing"), it would take him a dozen to claw back up to where he was. At one point, he spent TWELVE HOURS working on a IXL section. After the second hour, he was disgusted. After the fourth hour, he was determined. One time, he was at an 88, and finally felt like he was mastering the topic. Nope, a mistake on the next answer sent him down to a 75%, and a mistake two problems later landed him in the 60s. He was devastated. Another four hours later, and he was still only at 70% proficiency. I took his laptop away and told him to go to bed, and try again in the morning. If he got to 88 again (the equivalent of a B+, I'd call it good enough). He was overjoyed to finally score a 90, and I heard him whoop and then say "Just WALK AWAY!!" He really wanted to hit that 100% mastery -- it was "personal" now. But he didn't want to spend another 12 hours on math. He laughed when later that morning, there was a certificate for "10 hours completed" in our email inbox. When he said "Do you think I'll get another one of these tomorrow?" (I think he was only half joking.) Thankfully, most have gone faster than this, but there have been three very hard-won 90% sections. When IXL says "limitless" questions, they aren't kidding. In the 10 hours and 53 minutes he spent on Simplifying Radical Expressions, Luke's 90% proficiency took 623 problems to earn! The rest of the frustration followed when Luke also attempted the "new" Geometry ideas. Even ignoring the "Smart Score" and just trying to figure out problems, and then studying what he did wrong if the answer was incorrect, he was way over his head. He used a web-based program to try to learn the material, but the program didn't click for him. Though we may revisit some of the lower-grade sections just to exercise his brain, he again "officially on break" from math again but intends to go back to IXL when he formally starts Geometry in the new year. He definitely sees the benefit to using it for practice, but not until after he's learned the topic material. You also have the option to add a "secret word" to each student. For Jude, we didn't add one; for Luke we did so that Jude couldn't accidentally access his section. Remember how I said we can use this on the laptop or an iPad? The iPad app is a relatively new feature. I really like it. Jude has tried a few sessions on it, and I have to say that the text is very crisp, even on an older-generation iPad. (Sometimes I find app versions of website programs can be a little fuzzy.) My approaching-middle-age eyes appreciate this! I also appreciate that it is easy to navigate AND you can access the sticker rewards via iPad. I was afraid that the coding wouldn't work so well, but they are easily earned and acquired. There is also a Language Arts program for students in grades 2-4. While Jude is on par with his peers for math and spacial skills, his language skills are developmentally closer to a preschool level, so he was unable to do any of the program. Luke, a 10th grader, clearly is too old for the program. This is a new addition to the program this year, and hopefully will be expanded in the future. Since we really enjoy the math program, I will be putting it on my "revisit" list for the little boys as they get older. Adding it to the math program is a very reasonable charge for another way to practice their skills. IXL offers multiple membership options. The first table below shows the pricing schedule for monthly memberships, while the second shows the prices for if you'd prefer to pay annually. Overall, we are very happy with IXL. I was happy to get the opportunity to review it using multiple users, and a higher level student. For our purposes -- being able to do schoolwork with a minimum of things to cart around -- it is perfect. I can teach on "home" days and use IXL for practice and review while we're on the road, and feel confident that despite our crazy days the boys are learning everything they need to be successful at math. 100 families have been honing their math skills with IXL. Check out their reviews by clicking the banner below.